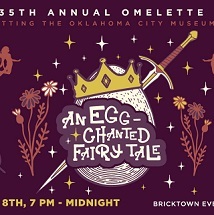 Join us in celebrating the 35th anniversary of one of the Oklahoma City Museum of Art’s longest running traditions, the Omelette Party! Together we will experience what happens after “Once upon a time…” with this year’s theme, An EGG-chanted Fairy Tale. Sponsorships are available for this event. Please contact Lauden Baker at (405) 278-8209 for more information.